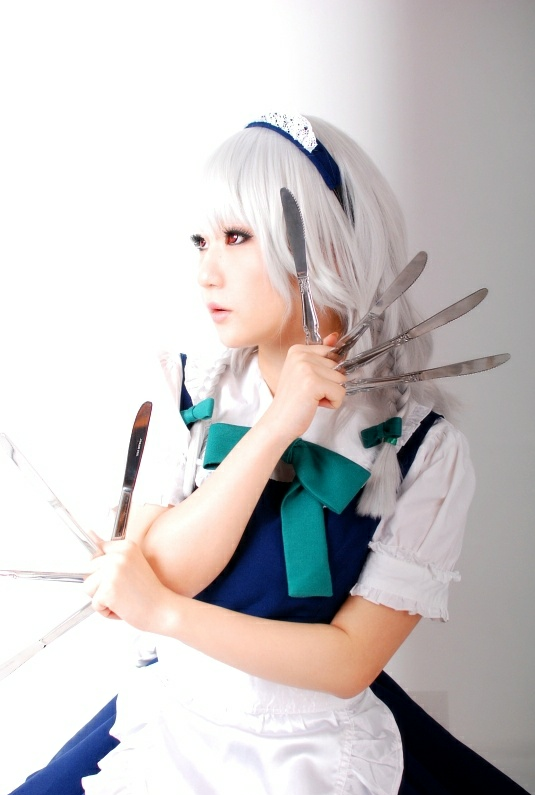 KOYUKI is cosplaying as Sakuya Izayoi from The Touhou Project.The Touhou Project, also known as Toho Project or Project Shrine Maiden, is a Japanese dōjin game series focused on bullet hell shooters made by the one-man developer Team Shanghai Alice, whose sole member, known as ZUN, is responsible for all the graphics, music, and programming for the most part. The Touhou Project began in 1996 with the release of the first game, Highly Responsive to Prayers, developed by the group Amusement Makers for the Japanese NEC PC-9801 series of computers. The next four Touhou games released between August 1997 and December 1998 also were released on the NEC PC-9801. The Touhou Project was inactive for the next three and half years until the first Microsoft Windows Touhou game, The Embodiment of Scarlet Devil, was released in August 2002 solely by ZUN after he split from Amusement Makers and started Team Shanghai Alice. Touhou Project became a media franchise spanning a steadily increasing number of official games, in addition to commercial fan books, light novels, and manga. I can butter you toast...or kill you!